There are few movies that better represent 80s style than the Back to the Future trilogy. Michael J Fox’s Marty McFly rocked a burnt orange life preserver, denim jacket and cool jeans. Best of all, Marty Mcfly wore an awesome Casio digital calculator watch – back then, a relatively expensive timepiece. In the years since, as cellphones eclipsed wristwatches in the portable calculator stakes, the popularity of calculator watches fell. Even so, the retro charm of the Marty McFly watch ensures that there are always a healthy number of customers looking to rock a Back to the Future timepiece. So, if you’re looking for a genuine Marty McFly watch to complete your Back to the Future costume you’ll need to know the exact model worn my Marty in the movie. Well, the model itself was never specified by the costume designers (damn their eyes for their poor memory), so to identify the watch we had to crawl through the movie frame by frame until we’d determined the model for ourselves. Marty McFly’s watch is a Casio CA53W Twincept Databank. The watch has an 8 digit calculator, 1/100 second stopwatch, auto calendar and alarm, and it’s water resistant to a depth of 100 meters. But you don’t care about any of that, right? It’s Marty McFly’s watch! That’s what matters. p.s. You should really read the hilarious top rating reviews for this watch. Oh my god this watch brings back so many fond memories of my childhood. I actually had this watch when I was a kid. I don’t know if it was the same one, because I remember there were a few different types. Man I really loved Back To The Future, I think I must have watched this movie at least 3 dozen times. I seriously can’t believe Casio still makes Mary Mcfly’s watches, but it’s awesome since I’m going to get one for my boy. I don’t know why I never thought about it, but I think I’m going to make my boy watch the movie too. Maybe he’ll love it or maybe he won’t, but I surely won’t mind watching it for the millionth time. What is so awesome about this watch is I had it got it for my birthday when I was 10. This movie/trilogy is so much a part of my childhood. I still think “life preserver” when I see anybody in a vest like Marty had in the first one. Amazing post, this blew my mind. I hadn’t even thought of Back To the Future in a while (ok, like a few days) so thanks for bringing it back! And now I’ve decided that I have to have that watch. I’ve been doing the goose down vest thing a lot this winter, and with a plaid button down and this watch, I have the rest of my winter look squared away. The price is so reasonable, how could I resist? 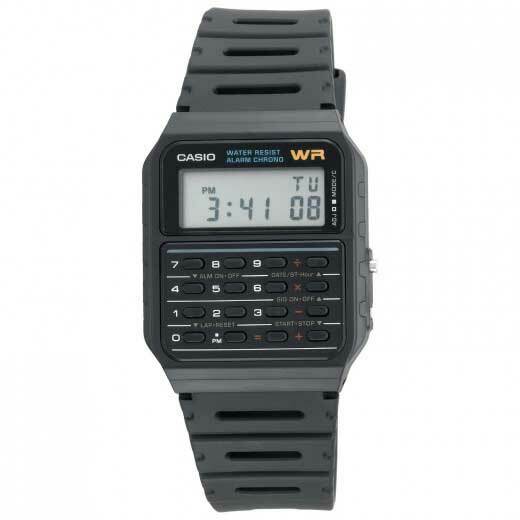 What is so awesome about this watch is back in the day if you had one you were considered the coolest kid in class. Now if your wearing one either your a nerd or somebody who loves 80’s nostalgia. However at that price I might have to buy one not only for me but my brother as well we were and still are huge Back to the Future fans. I just got this watch. Download it and spread it around. By the way, one thing I had difficulty with was changing from 24 hr mode to 12 hr mode. You do this using the + and – buttons to switch modes after you have clicked the recessed button on the watch to change time. Just a little handy tip. Forgive the late response to this post. 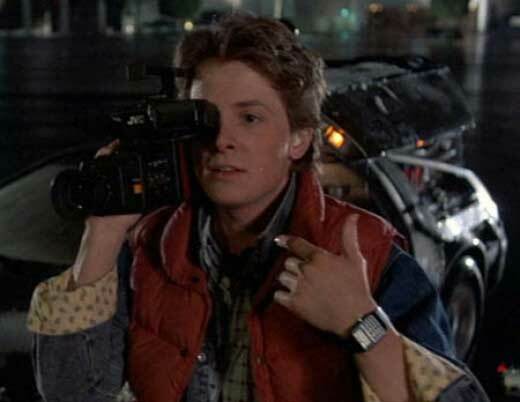 The watch in the first back to the future is actually a Casio CA-50. These were available in 1984 at the time the first film was made. The CA-53W came much later. Casio CA-50 is extremely hard to find, and if by chance you find one prepare to pay a hefty price.